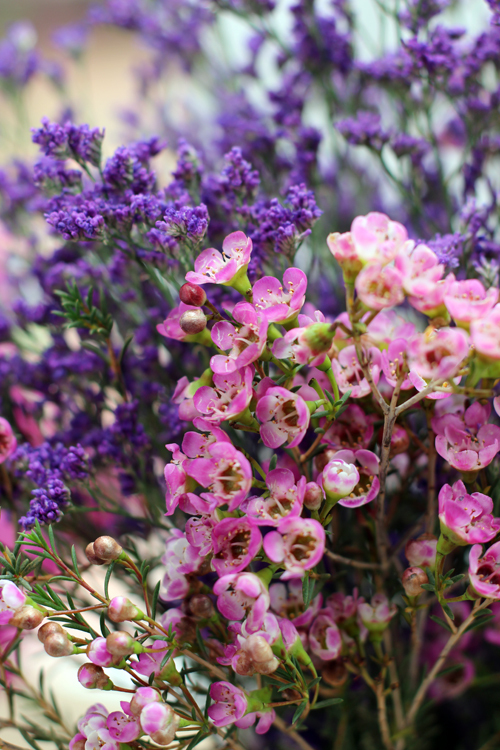 This week on 'A Bunch for the Weekend' - I'm featuring pink waxflowers, purple Limonium with some good old parrot tulips that you might recognise. 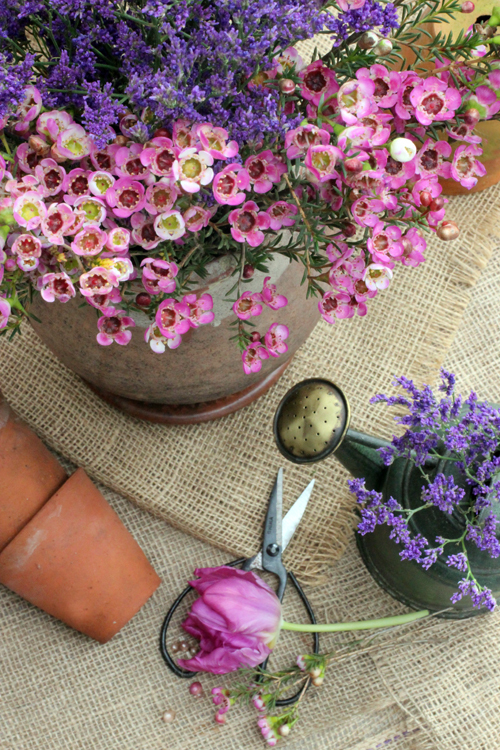 "It's always a pleasure and lots of fun to buy a bunch of flowers for the weekend and this series of blog posts, called 'A Bunch for the Weekend, I will show you how you can make quick and easy flower arrangements for your home. Buy the flowers where it's convenient and easy for you whether that is from a flower stall, farmers' market, the supermarket or a florist. 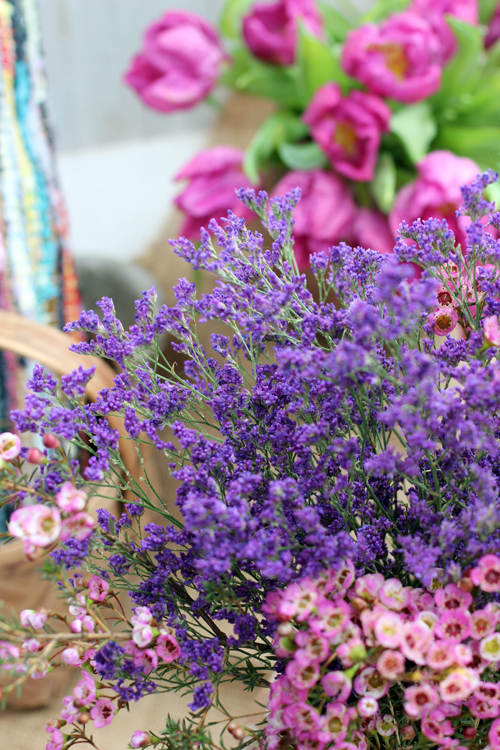 Always try to buy seasonal flowers - they will last longer and they will be a lot cheaper. Make sure you condition the flowers as soon as you get home. Remove any foliage that will end up below the waterline in the vase. 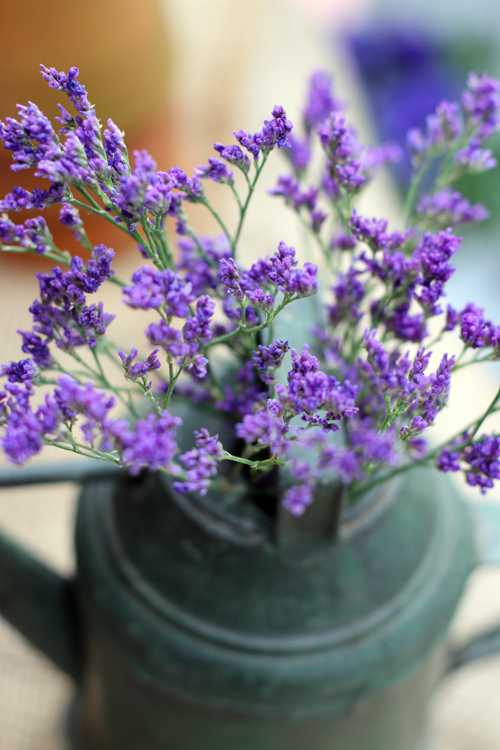 Trim the ends of the stems at an angle and put in fresh water as soon as possible." After conditioning the flowers let them rest for a few hours or overnight just to give them time to absorb as much water as possible. If you are able to keep them in a cool place even better. I have covered the table with a length of hessian fabric - leaving the cut edges 'raw' to give that overall feel of rustic country. The two rustic terracotta jars are from Turkey. I bought them from a shop selling terracotta pots in all shapes and sizes right around the corner from my house. The shop was closing down and selling everything very cheap. One has handles and the other one is a bit shorter and rounder and they are both perfect for flower arrangements. I bought the little green watering can at Chelsea Flower Show last year - but had not tried to use it for flowers yet. I put it under the tap to fill it with water and instead of filling up it started within seconds to leaking like a sieve. It just made me laugh as it was totally unexpected. 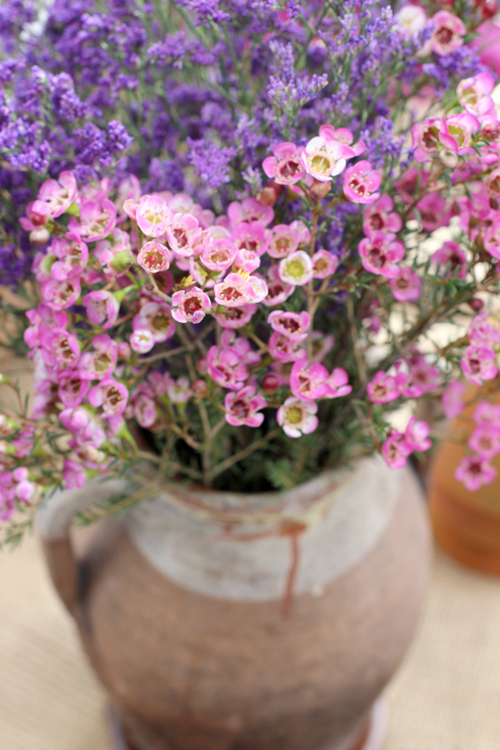 The Limonium and the waxflowers are usually used as fillers for mixed flower arrangements. 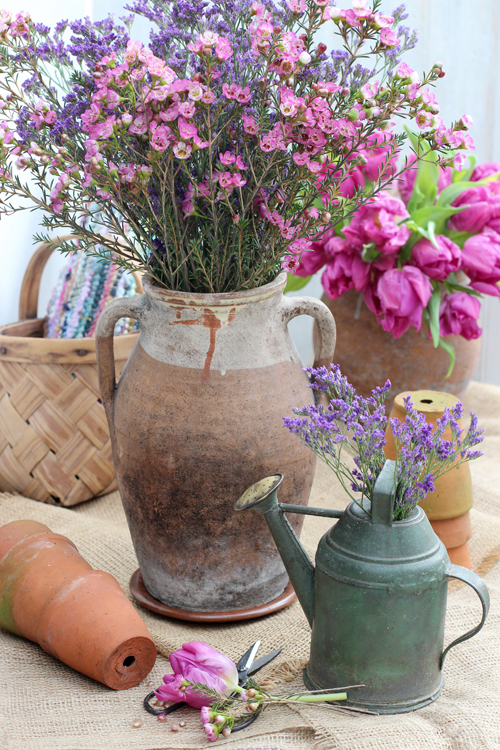 I thought they looked lovely together and mixed two bunches of each in the tall terracotta jar. Filler flowers are usually sold for a lower price so perfect if you are on a budget. Lots of flowers and lots of colour for very little money. A perfect combination and a win, win situation! Here is another image of the notorious watering can! 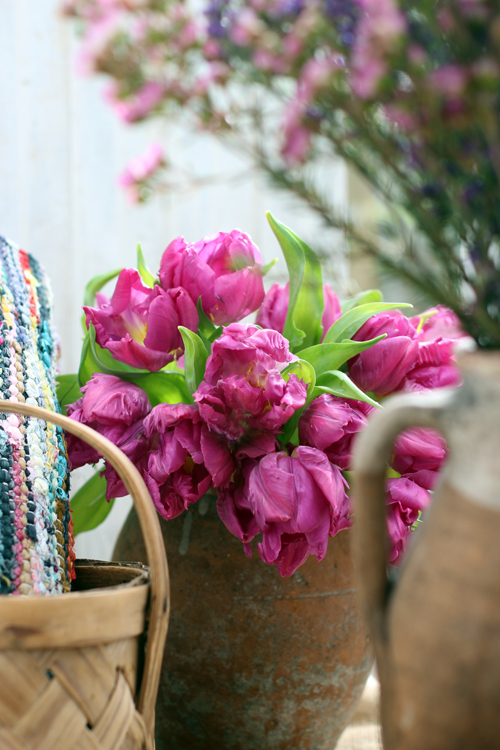 The deep pink parrot tulips I had used before in a previous blog post. They lasted for ages and I decided to use them again for this post. Here I simply swapped the container and put them instead in a matching terracotta jar. They looked perfect sitting in the background of my 'Rustic Country' scene. 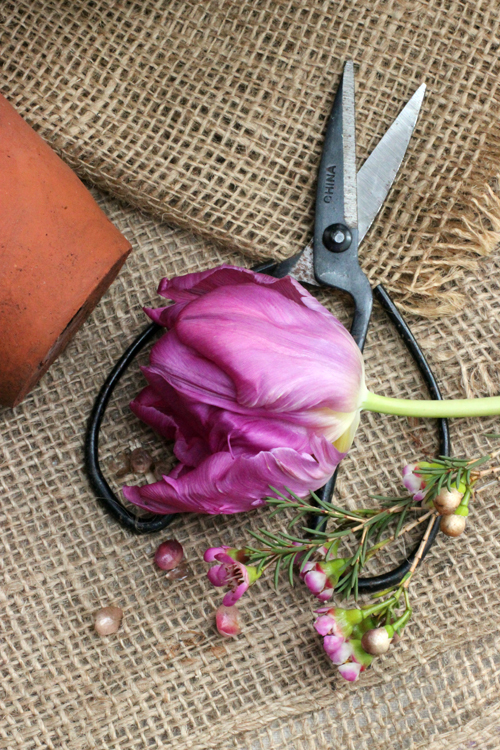 Enjoy your flower arranging and have a fabulous and floral weekend! Thank you for visiting 'Of Spring and Summer' - I will be back on Sunday morning with another 'Florets - a floral quote by someone passionate about flowers. I'm looking forward to seeing you back here then. P. S. Did you know that you can subscribe to receive a notification via email whenever I have a new blog post. Just fill in your email address at the top of my blog on the right. P. S. If you are looking for more floral inspiration you can go over and have a look at my Pinterest boards. I now have just over 12 000 followers and around 200 boards all relating to flowers, flower styling and flower arranging. There are boards on individual flowers and shows how to arrange them. Other boards show different ways of using vases and containers. Simply click on the link below and it will take you straight there. Nu tar vi helg och njuter av lite ledighet vännen!